This week I put the commercial galleries on hold and decided to check out what’s happening in the institutional realm. 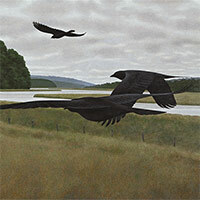 What could I possibly say about Alex Colville that has not already been said? As I wandered through the show (for the second time!) I tried to figure out what draws people to this artist. Alex Colville’s life was shaped by the Depression, WWII and a marriage lasting seventy years. He lived in a small town. Those few facts constitute a set of experiences shared by few people living today. And yet the crowds seemed to identify and recognize something personal. 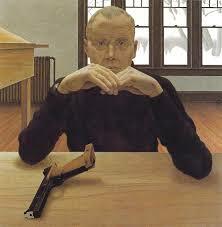 In fact, in August, when I dragged a visiting Australian relative to the AGO – a guy who was unimpressed by Niagara Falls and expressed disdain for art in general – he was transfixed by Alex Colville’s paintings. They seemed to speak directly to him. 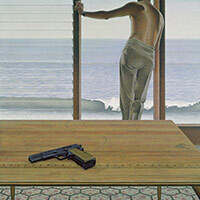 He even purchased a reproduction of Pacific, an elegantly composed painting all about dispair. Exacting, taut, restrained, subtle, precise: these words can all be used to describe the paintings. 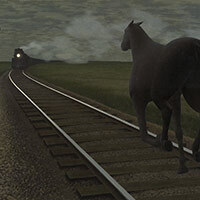 But within those muted tones and careful, painstaking surfaces Alex Colville planted content. Graceful young athletes and middle class pleasures are there but so too are fear, decay and death. In his rendering of the revolvers, bolting terrified horses, crows and his own bleak gaze at the relentless unfolding of life these paintings are not so much about any particular external crisis as they are about an individual’s efforts to endure. Alex Colville addressed the human condition and his public responds. 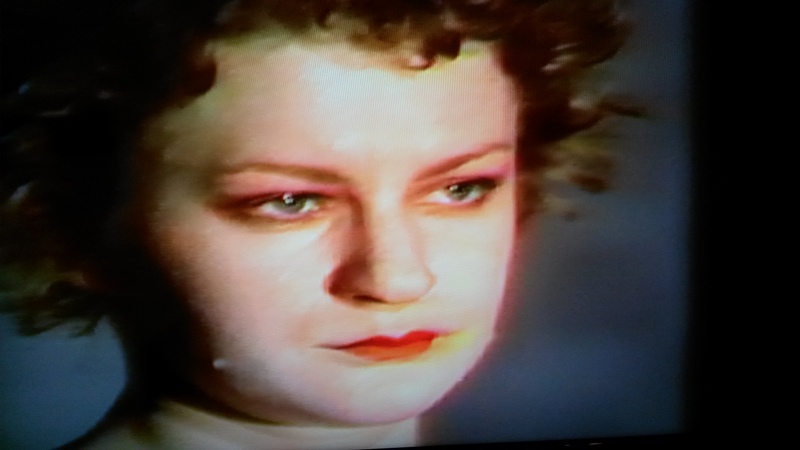 I accidently came upon an artist’s talk, by Lisa Birke, at V-Tape. I respected Lisa Birke for the dignified tone of her talk. She gave a nod to Kant and Burke and the sublime but she was clearly in the intuitive, groping camp. She talked about how she made the piece: failing and trying again and being cold and frostbitten and alone in the dark early morning; being embarrassed and unsure and continuing to try and figure something out. The result is her video entitled Red Carpet. The piece is lovely to look at, capturing some gorgeous extremes of the Canadian landscape experience. It also constitutes an interesting response to the Celebrity Gossip culture that seems to be taking over the world, i.e. she is in solidarity with not just the consumers but also the producers of the endless painful parade of distraction. The red carpet leads the protagonist under water and to obliteration. She can’t stop. 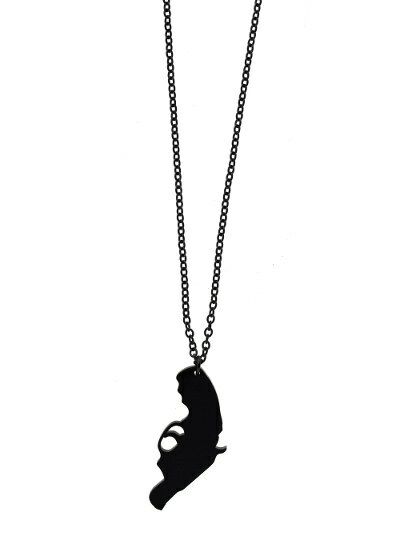 We can’t look away. I went back to the AGYU to have a closer look at the Is Toronto Burning? show. 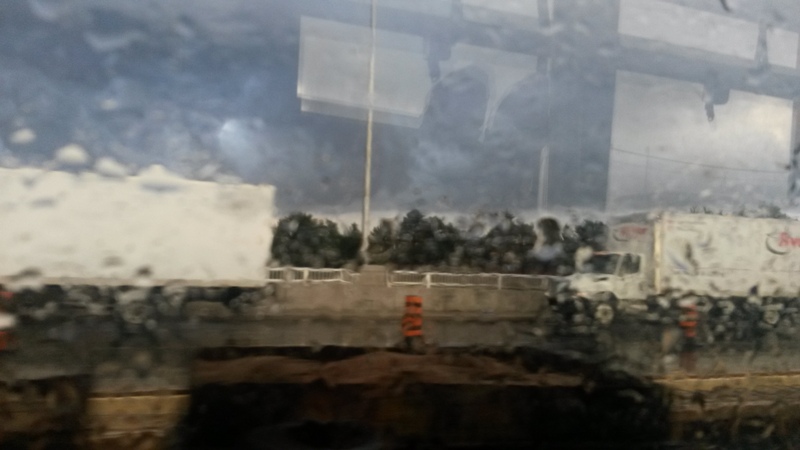 Once I crossed the 401 there were thickets of Ford Nation signs everywhere and it rained hard. I prayed for God to save Toronto. It was luxurious to have this trove of artefacts to myself as almost no one was around. Some of the artists are so vividly represented. 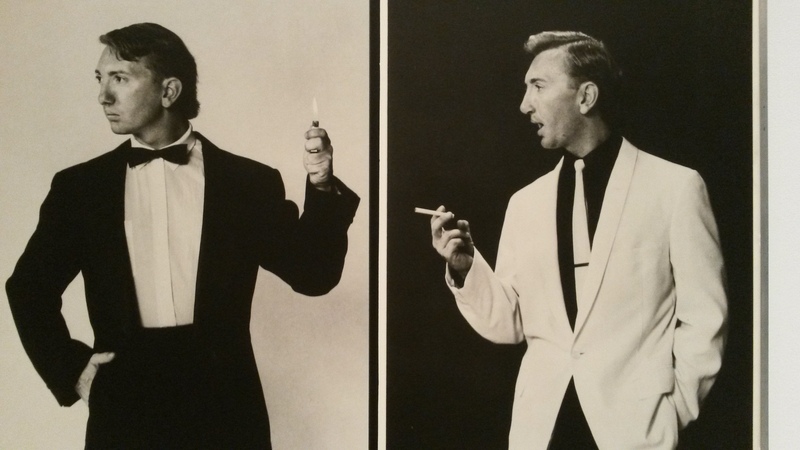 I’m still not quite sure what to make of the question “Is Toronto Burning?” but David Buchan, for example, was definitely on fire during those years. 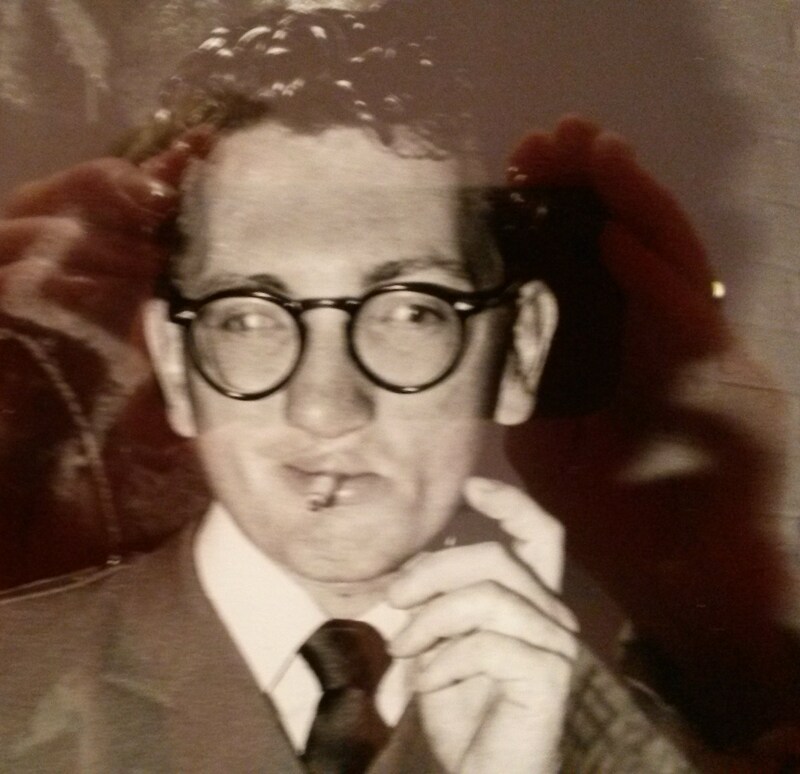 He was so rakish and arch as a rat pack Lothario or Bond man or lounge act. There are numerous videotapes of David Buchan lipsynching. I watched him perform “Bread and Butter” (which was originally recorded by the Newbeats in 1964). It is unforgettable. I watched tough girl Elizabeth Chitty furiously shrugging her shoulders and whipping out her Polaroid like a lethal weapon. And I looked around a little more carefully. 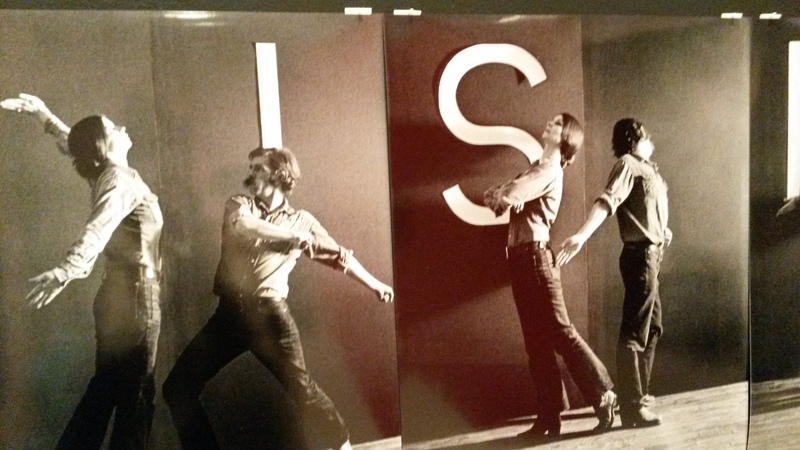 Somehow at the show’s opening I missed the piece by Carol Conde and Karl Beverage in which they approximate poses from China’s Cultural Revolution ballet to spell out Art is Political. I really like the ambition in this artwork. Here is an image from a Chinese Ballet which was hosted by the Kennedy Center in Washington in 2011. 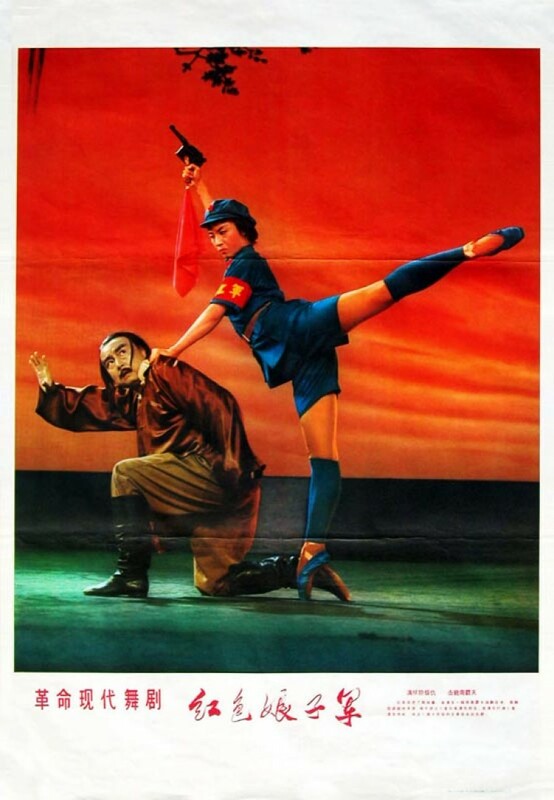 The caption reads: A landlord from the ballet cowers as one of the revolutionary woman soldiers hardens her face and strikes a pose with her pistol. But most of the time I spent watching Colin Campbell’s delightful videotapes. 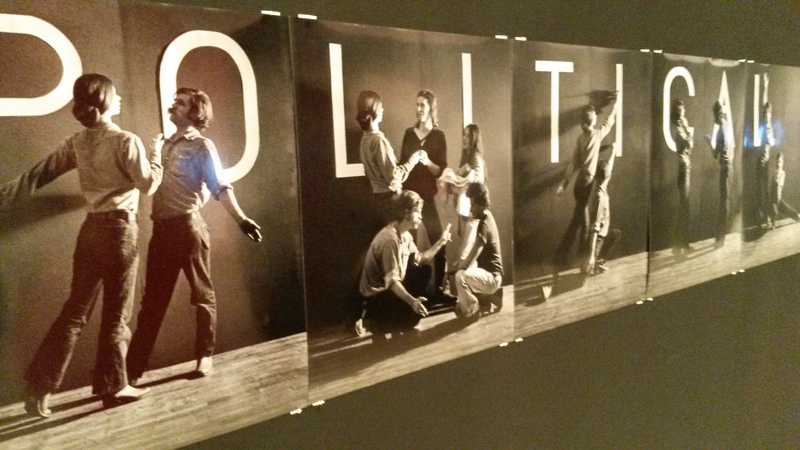 One scene featured Colin with Ron Gabe, Tim Guest, David Buchan and Stephen Davey. It seemed like yesterday.